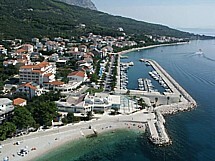 Tucepi is a tourist resort in Central Dalmatia, 55 km south of Split. The marina is located in a small harbor in which boats enter on the southeastern side, and it is on ideal position as a start point for exploring middle Dalmatian islands of Brac, Hvar and Korcula. Marina is situated in the centre of Tucepi , with numerous nearby restaurants and bars, supermarkets, and guests can swim and sunbathe on kilometres of beaches of the Tucepi Riviera. Approach: When approaching, the principle landmark is a modern bell tower above the town. On the breakwater there is a red light. Be aware of the shoal off Dracevac point. Mooring: The marina has 200 berths and 30 dry berths. All berths have water and power supply. Facilities: Reception, toilets and showers, parking lot. The marina is equipped with a slipway. How to reach Tucepi marina? If arriving from the direction of Austria or Hungary via Zagreb, you can use the highway Zagreb-Split; if arriving from the direction of Italy via Rijeka, you can also use the same highway. From Split you can reach Makarska via the Adriatic highway (just follow the guidelines for Makarska). If travelling by bus, you can reach Tucepi from every bigger Croatian city via Split. There are regular train connections from Zagreb to Split, from where you can continue toward Tucepi by car or bus. There are regular ferry lines from Rijeka and Ancona toward Split, from where you can reach Tucepi by car or bus.